Australian Dust Control prides themselves in their service, expertise and attention to detail. As a result of this Australian Dust Control now has a client base which is nationwide. 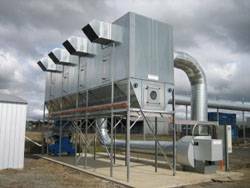 Australian Dust Control can design a customised dust collector to suit the individual needs of each customer and each year more businesses are taking advantage of this. A recent project for Australian Dust Control was to design, manufacture and install a Reverse Flow Dust Collector for Valley Windows in Morwell, Victoria. They are a well known manufacturer of timber windows who were looking at upgrading their existing dust collector system. The dust collector system they were using had several individual bag units. Valley Windows were looking at future proofing their business with expansion in mind. Therefore the individual bag system dust collector they were using was unsuitable. Australian Dust Control installed a Reverse Flow Chain Filter Dust Collector for this purpose. The Reverse Flow Dust Collector is a modular system which new modules can be added to as the business grows. A sound enclosure was installed around the fan to ensure the quiet operation to meet guidelines set down. The chain filter on the Reverse Flow Dust Collector by design, allows for extra modules to be added to the Reverse Flow Dust Collector. Valley windows also chose to have the Variable Speed Drive fitted. This special energy saving feature is unique to Australian Dust Control and can potentially reduce energy bills by 50%. The waste produced in the manufacture process is shavings and sanding dust. A Briquette Machine was installed to handle this waste, which then converts the waste to briquettes with at a ratio of 10 – 1. Australian Dust Control believes that the Briquette Machine is becoming a more popular and cost effective method for disposing of this type of waste.